924Board.org :: View topic - Torque tube pattern, can someone confirm? Torque tube pattern, can someone confirm? Posted: Thu Nov 21, 2013 3:15 am Post subject: Torque tube pattern, can someone confirm? 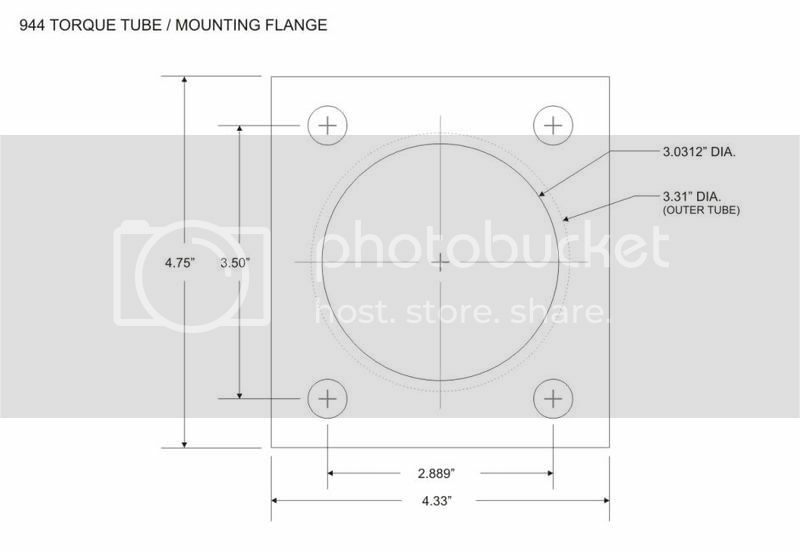 From poking around on the internets, I get either 94mm or 77mm center bore (for dowel pins - which one? ), 73mm horizontal distance between holes, and 89mm vertical distance. I also need to have the whole assembly flange-to-motor to be 6.4" thick. Can somebody confirm this for me before I get started on the adapter plate? My design will take my bellhousing, add a plate with a hole in the middle of the same diameter as my bellhousing's input shaft hole (about an inch and a half), and bolt pattern of the torque tube on the outside; then a second plate with the same ID and OD of the ID of the torque tube. I'll then slide all three on a shaft, drill ~6 holes all the way through, and bolt the whole sandwich together; Then drill the four holes in the bellhousing following the pattern on #1 spacer. The pattern is the same for the 944. Look at the Texas Performance Concepts site for bell housing adapter drawings, etc. Most people doing swaps other than the established ones (Chevy V8, Audi, etc.) sometimes will cut the bellhousing off of a FWD transaxle in order to have the input shaft center which is critical to align everything properly and then mark and drill the bellhousing to match the torque tube nose. I think that is what the VR6 and 1.8T swap guys did. Most excellent - this is exactly what I've been looking for. So, 77mm bore, 73.4mm horizontal, 89mm vertical, M12 bolt holes. I'll post an update as soon as I have something substantial. We have 2 months to do this.